Do you ever catch yourself glancing in other peoples shopping carts while at the grocery store, Costco or Walmart? I sure do! When I worked at Costco one summer and used to love checking out what people had bought. I LOVED googling and youtubing videos and photos of new Mama’s diaper bags while I was pregnant. I don’t know why. The same reason I like looking in people’s carts I guess? Maybe it was the fear of being out and public and realizing oh *&*^^%^@ I don’t have a diaper! I decided today to share photos of what is in my diaper bag. I really just grabbed my diaper bag, camera and shot. The last place I went was a playgroup so this is exactly what I take out! 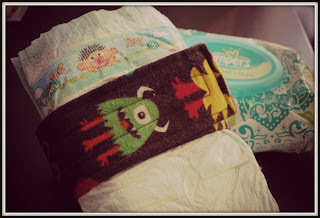 I usually have 5-6 disposable diapers (3 or 4 cloth if I'm taking them) and 1 swim diaper (you never know). Change pad (not pictured...I forgot!). Wondering what is around my diapers? Why my monster diaper strap of course!! 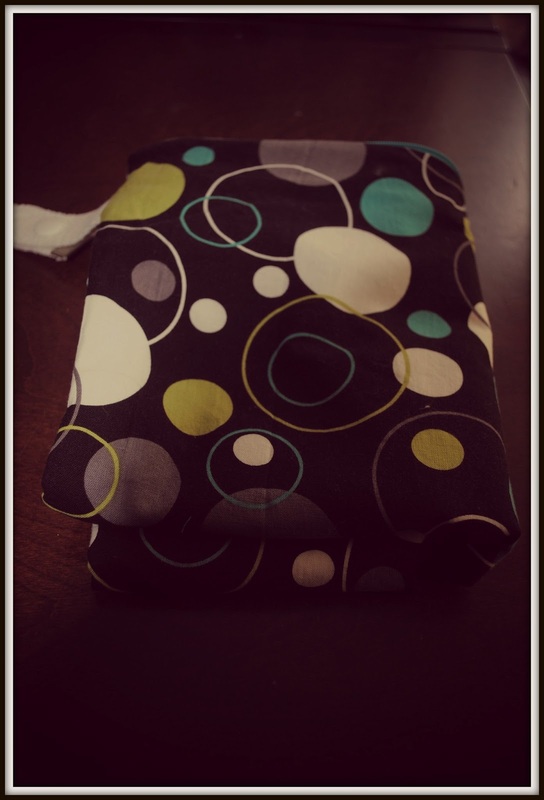 It holds the dipes together so they are quick to find, keeps them nice and flat (sometimes I find the "puff" up when shuffled around in my bag). It is also great if I only need a "just in case" dipe and some wipes! 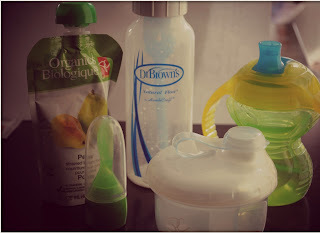 Bottles filled with water - I pack however many I will need for our day out. We use Dr Browns and I love them! The only negative is if they get knocked over the water leaks into the lid. Formula dispenser- I have two. This is the smaller one. It can hold enough for 3 6 oz bottles. My larger fits 4 8oz bottles. When I was pumping I used to have to carry around a cooler to keep the breast milk cold AND bring my pump along if it was a longer trip! Sippy Cup - Emmett can't quite hold his own bottle yet but boy is he trying!! He gets jealous of the older babies and their sippy cups at Playgroup so we've started carrying around his own. Food - We generally make Emmett's food but that can sometimes be hard to transport. Especially when we are just bringing it for emergencies. I like these PC Organic Tetra Packs. No risk of glass breaking, plus I like that they are organic. It is REALLY hard to find single fruit/vegetables in these packs in Canada but PC has a few now which is great - but they sell out so fast! The little green guy in front of the tetra pack is a screw top spoon. It just attaches onto the tetra pack and you don't have to worry about bringing a bowl and spoon! I always bring 2 burp cloths...just in case one gets covered in spit up...which it usually does. Change of clothes (jammies too if we are pushing bedtime!). Hat - just in case a spur of the moment park outing occurs! Pretty self explanatory right? Gotta keep him busy somehow! Right now I'm packing things he can chew on and things that make noise (oh goody). 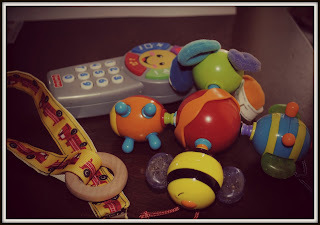 I don't always bring these along - today it happened to be in my diaper bag as I CD at playgroup. I also bring them along if we go on a day long trip or swimming outing. They are great at keeping moisture (and smells from outfits that succumbed to the oh so dreaded blowout) in! We also have natural teething drops but they are in Emmett's room right now. 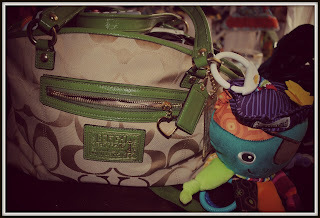 My diaper bag!! Well...one of them. This is my fav! Can you guess why?! Octopus also accompanies us everywhere! 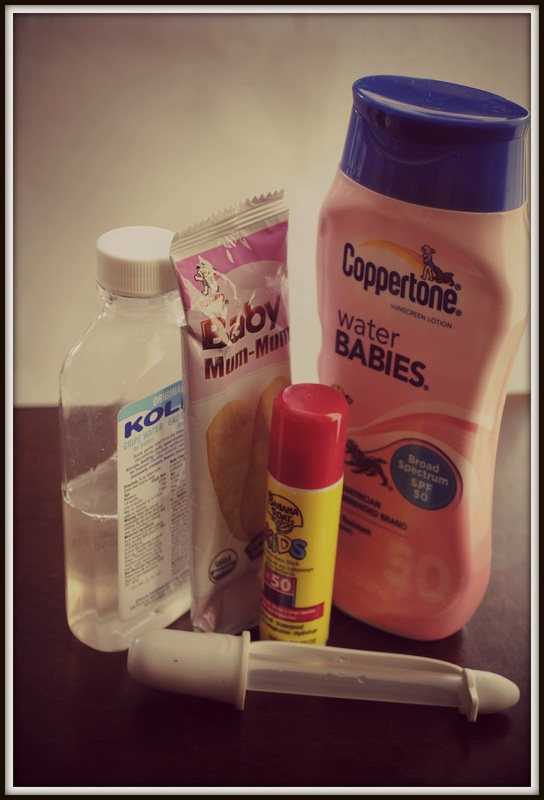 Well that's it...the long list of things in my diaper bag. Hard to believe it all fits in there! Do you have any diaper bag essentials? You should make this a regular feature! I know I am nosey, so this is fun...lol! I am so nosey too! 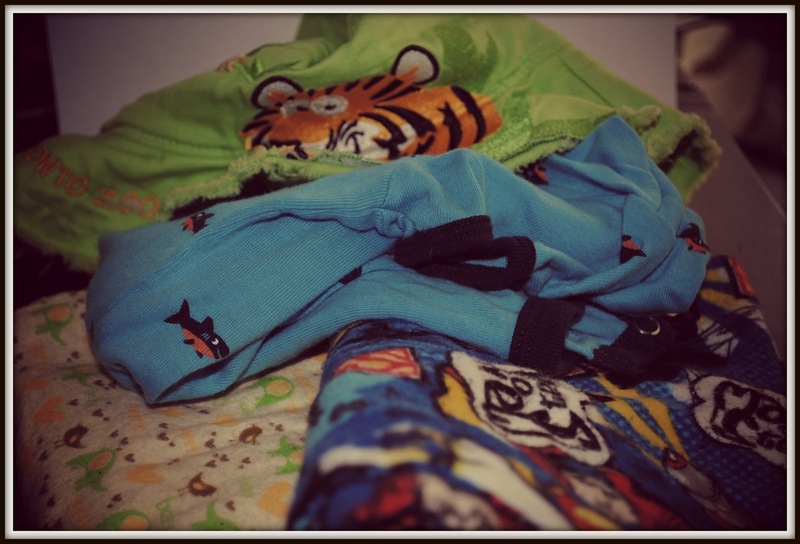 I love creeping through people's baby stuff...gives me ideas on what I need! I think I am going to start working on a "What's in my" theme!